Lost and Found: Medals, Papers, Veterans and Friends . . .
Found a dog tag, medal, papers, or uniform of an unknown veteran? Looking for information on a family member or lost veteran? Post your items and information here for others to search! Post pictures, links, and all information you can so others can find it . . . Please, no selling of items or information, or linking to solicitations of any kind. Feel free to click ‘Leave a Reply’ at the bottom of the page to post. This entry was posted in Uncategorized by dhberry60. Bookmark the permalink. Hello, I have a U.S. WWII helmet that definitely comes from the city of BASTOGNE. He belonged to T.Mckenna. The latest figures from the number are 7152. Can you help me 😦 ? Bastogne, Belgium is the town where the US general refused to surrender to the Germans using the term “Nuts” during the Battle of the Bulge in 1944. This is a huge info site with great photos. This is only one page there are huge amounts of other links. I am looking for any information on 1st Lt. Charles F. Miller from Elizabeth, NJ. He flew with the 427th BS and was killed in action over Germany on 9 September 1944. He was my uncle and also my Godfather. I can be reached at gjmiii@hotmail.com, 23 Fox Hunt Road, Ringoes, NJ 08551 or at 908-782-6316. Thank you. This is another great site which would take forever to get through.I passed it on so others could dig. I found a bracelet- for Thomas J Gallanis, with his service number on it- looking for a descendant who would want it. It’s WWII. The next 2 live together looks like dad and son from name and age. Civilian Occupation: Skilled mechanics and repairmen, n.e.c. Hi Jane. I am curious. Were you able to find your father? I was going to look up information for you on a genealogy site but it looks like Barbara did that already. I hope you were able to find something. I am looking for information on my dad, Capt. Joe V. Ryan who trained men in aerial map reading ar Ft. Sill and then was sent to an active command in Europe. All I know is that he was a Captain in the Field Artillary, he entered through Italy, ended up in Austria and stayed after the war in Vienna to work with the diplomatic corps. I do know his unit discovered a concentration camp in Austria but I don’t know the name. Looking for any information on my dad, Clarence Rube King, stationed at New Caldonea, South Pacific during the period 1940-44. He was killed in a airplane crash in 1970 when I was 22 and knew very little about his military service. Thank you. Looking for a Joshua Geller (Geler, Gelar) likely from New York who served in WW2. His father was named Todd (Todres) He is my grandfather’s cousin and they have not had contact since 1950’s. Thanks. also may be listed as Heller. Hi. Can you email me at dogtag73@gmail.com? I might be able to help you. I’d rather not post info on a living person on the wall, though. As long as you have information on your Grandfathers date of birth and a few more details, I might have a shot at tracking him back through the Census records. Anthony, I think I can help you. We would need to call up the library in the county where he died and see if an obit was published. If one was published, the names and locations of surviving (and even previously deceased) family members are usually included. From there, you can try using the whitepages. He died 6 years ago, so he will still be in the http://www.intellius.com database. Getting an obit may not even be necessary in order to find family members, because intellius lists likely family members in the prelim search part that doesn’t cost money to use. It’s hard to explain, but it involves a lot of checking and cross checking to narrow it down. He doesn’t have a really common name, which makes it a lot easier, too. If you can email me, that would be best, because I don’t want to post contact info for relatives on the wall, Thanks. I think I have his grandsons information. I’d like to thank ALL of our service men & women first of all! My father is WWII Veteran & has lost his dog tags – is it possible to replace them or do we just have to hope some honest person may someday turn them in somewhere? First I am looking for anyone who was in, or knew someone in, the 1st Infantry 18th Division Company C. My grandfather, Clarence Henry, was in that company during the war but passed away before I was old enough to realize the significance of learning about his experiences in the war. Since his passing I have been trying to piece together as much of his time during the war as possible. I am also looking for family of PFC. Kent Post of the USMCR’s 17th AAA Bn. “C”Btry. I have photos of him during the war and have been trying to find him for 5 or so years now. This guy’s letters home and interview with lot’s of company “C” info it might give you exactly where Clarence Henry went through. Want it Tuesday, June 11? Order within 63 hrs 26 mins and choose One-Day Shipping at checkout. Infantrymen is the emotional story of Ralph Gordon, a typical American GI serving in Germany during World War II. Born in Philadelphia, Pennsylvania, Ralph enlisted in the U.S. Army at the age of eighteen so that he could do his part to defend his country and way of life. After eleven months of fighting in the European Theater of Operations, Ralph was one of only three men from his company to survive from D-Day through to the end of the war. Join Ralph and the men of Company “C” 18th Infantry 1st U.S. Division as they cross the English Channel to storm Omaha Beach and battle through the hedgerows during the breakout. Fight beside them as they make their way through France and Belgium on their way to Germany. Finally, share in the pain of the many losses suffered by Ralph and his friends. Alexandria, you might want to try to order both men’s military records from the National Archives and Records Administration. I can walk you through that process, because there is a certain way you have to phrase it in order to get them to release all the records. I can search ancestry for you to see if I can find Census records for Kent Post that might lead to finding out his year of birth, then his date of death, and then from there, a possible obit to find his next of kin. Census records are great, because if he had siblings, that gives us another avenue to research if we run into a dead end. However, it would be helpful to know the circumstances of how you got the picture. For instance, if you bought it at an estate sale or found it in a thrift store, I’d probably begin looking for a Kent Post in the State/Area you got it from to try to narrow it down. Can you email me, please and provide me with more information? bluenoser provided great info on how you can research your grandfather’s unit further, so I have nothing to add to that part of the research. I found this. One thing that could really make this easy for you is to have your aunt call up the Veterans Administration and ask them if they can tell you his unit. The information above and his serial number should be sufficient. If you tell them that you are trying to locate his unit so you can do further research, they may be willing or able to give you that info. That might be the quickest route for you. Was he a member of his local American Legion or VFW post? If so, they might have something about his unit in their records, or his VFW or Legion buddies might remember him talking about it. The Aleutian Islands in Alaska were a pivotal battleground during the war. Once you find out his unit, it will be much easier to track things down from there. This Kent P. Post was a PFC in WWII, just like “your” Kent Post. I also found Marine Muster Roll records for him. He might still be living. Wouldn’t that be great? Station:	Heavy Antiaircraft Group; 17Th Antiairchaft Bk., Corps Artillery, V Ac, In The Field Artillery (17th AAA) They served in the South Pacific. So, now we have confirmation that we’ve found the man you are looking for. Now it’s time to find his family. Please email me and I’ll send you potential contact info. I used http://www.intellius.com to find out names of his relatives, since I found no listing for him. Using that information, I found his son. I am positive it’s his son, and he is most likely living with either his son or his daughter, because I find no listing for him, but also found no Social Security Death Index. Living with a relative would explain the lack of a phone number in his name. I don’t want to post his son’s contact info here, (due to privacy concerns) though, so please email me and I’ll send it to you privately. I hope this has a happy ending. It’s really nice of you to want to return this picture to his family. I’m sure it will mean the world to them. I am so sorry it took me so long to see these I did not get any update for this site via email and had gotten rather side tracked with nursing school I would love any more help you could provide. I also found his obituary on ancestry.com which lists even more relatives. He was a very active man in the American Legion and VFW and it seems like he was also interested in genealogy, as well, specifically, his ancestors who had served in the American Revolution. I’m sure it will be very comforting to his family to have a precious photograph of their father’s returned to them. Thank you so much for all of the help. I actually did find his obit back in May but with little other than the obit info I was holding on to a little hope that it might not be him. I think I may have found his son but would love any contact info you scrounged up because as of yet I have had no response from him. I am looking for anyone who may have known my father Eddie Corcoran. He was stationed in Watton England during the war, I think he had a friend named Don Reynolds while there. Any info will be greatly appreciated. Seeking information and photos of Lt. Fiume Cascioli, Army Air Corps, lost over English Channel, from Mt. Kisco New York. This might be a start…Go to this link his name is on this Memorial wall for WW11 Veteran’s in Ny. Brief Scope: This series contains records of approximately nine million men and women who enlisted in the United States Army, including the Women’s Army Auxiliary Corps. CIVILIAN OCCUPATION 097 Managers and officials, n.e.c. Fiume C Cascioli, "United States, World War II Army Enlistment Records, 1938-1946"
Civilian Occupation: Managers and officials, n.e.c. Seeking information on Corporal Marion F. Collins, and/or his/her? descendents – last known address 121 W. Washington, South Bend, Indiana. My father Howard E. Turcotte passed away recently, and had Corporal Collins name and address and a serial number in his personal effects, and I am looking into what it may relate to. Any assistance would be helpful – thanks! Marion was the son of George W. Collins and Maggie Speer. He married Burlie Sims, daughter of Clarence Sims and Nora Taylor, on June 22, 1915 in Monroe County, Indiana. They had two daughters, Helen L. Collins Hall, and Mary E. Collins. Marion F Collins, "United States, World War II Army Enlistment Records, 1938-1946"
D. Hodge, I’m sorry for your recent loss. My own mother also passed away recently. I might be able to help you locate a relative. Can you please email me and I’ll see what I can do? Sorry, forgot to put in my email. dogtag73@gmail.com Just to be clear, I don’t charge a fee for research. I’ve helped people return a lot of tags and I have a pretty good method now for finding family members that works at least 90% of the time, so I might be able to help you find his family. My father, 1st Lt. Charles A. Vetter, service #O-381939, was in the Army cavalry in WW II. He survived the war, to be killed in mysterious circumstances in Occupied Japan on April 20, 1947; he was born on April 20, 1918 in Queens, NY. All I have been able to find is an interment record, in which he is listed as being in the Ordnance Dept. Thank you so much. My father was the first Charles A. Vetter in your list; he was born in 1918. I wonder if the other Charles A. Vetter was a cousin; they both were born and lived in Queens. Last residence was Lake Wales, FL. Wife of Charles A. Vetter, SC2, US Navy, WWII. CIVILIAN OCCUPATION 732 Semiskilled construction occupations, n.e.c. Civilian Occupation: Semiskilled construction occupations, n.e.c. Thank you very much for the information. It is possible to know what unit he belonged to? Is he still alive? I really thank you for your research. Waiting for your news. THANK YOU for your motivation. Did you find his family, yet? I might be able to help locate a relative, if you still need it. You are trying to return it to family members, right? You can call up the Delaware County, New Jersey Public Library and give them his name and date of death. 1 September 1994 is his Date of Death. They can check for you to see if an obit was published. If one was published, it may have the names and locations of his surviving family members. From there, go to the whitepages.com site and you might be able to find them. His kids would most likely be in their late 50’s, 60’s, or maybe even early 70’s, so that can help narrow it down for you if you get a lot of results. Also, if husband and wife are listed in the obituary, pay attention to the “Associated/Family Members” section below the listing on http://www.whitepages.com and see if any of the names from the obit show up together. That will give you a clue to make sure you are on the right track. If you need more help after that, you can email me and I’ll see if I can find contact info for you. dogtag73@gmail.com. No fee for research. Hi Jerry. With the help of the enlistment record you have his date of birth. I can go to ancestry.com and see if he is still alive. If he has passed away and I can find his Social Security Death Index, you can try to get his obit. I don’t charge a fee for research and would love to help you return this dog tag and badge to his family. My email is dogtag73@gmail.com. I don’t want to post family contact info publicly, so if you email me, I’ll see what I can do to help you. I commend you for wanting to return these items. I am looking for information to contact his family (wife, children maybe?). I would like to let them know I found something that belonged to their father/husband/grandfather that he lost during WW2, defending our freedom. If you can help me, in any way, please contact me. Hi I looked at white pages and there is no surnames for Theiss. Hi Jody. Thanks to bluenoser, we know his date of death now. You can get an obit from the library, if one were published. Obituaries are extremely valuable because they usually list the names and locations of family members. In his case, he died a long time ago, so the locations for family members in the obit might be incorrect. In that case, there are other ways to find out where they are living now. If you can’t get an obit, there are other ways to find his family by using old Census Records from the 20’s, 30’s and 40’s to find possible siblings and more information. Sometimes it can be a complicated process, but usually eventually yields results. No fee for research and I’m happy to help since you want to give back the item to his family. That’s really nice of you! dogtags73@gmail.com Once again, thanks to the makers of this page for providing such a valuable resource for others to get help and information. oops. correction dogtag73@gmail.com is the correct email. Rome, Arno, No Appennines, and PO Valley. i am looking for information on my grand father (stanton mead porter) for my aunt (her dad). he served in wwll. we dont know much, we were told he was army and was told he was airborn, if anyone could help or direct me in the right direction i would greatly appreciate it. D.O.B march 15, 1928. So, he was an enlisted man in the Regular Army. Now I’m researching WWII units in Alaska that might have had an Airborne Division. I’ll post whatever I find. Thanks in part to the Internet, a long-lost dog tag belonging to a U.S. Marine who served in the Vietnam War is about to be reunited with its owner. 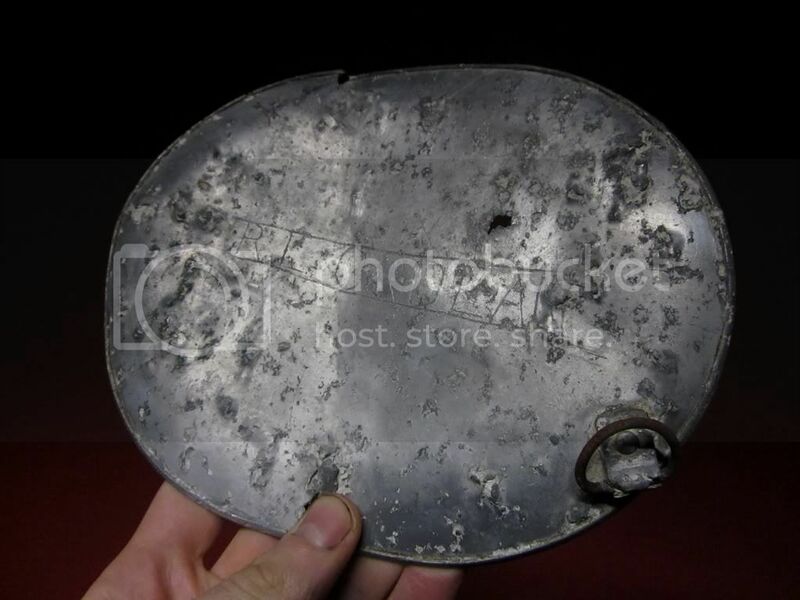 A photo of the tag (see above), which was found by chance two years ago by an Australian teacher visiting the site of the former U.S. military base in Khe Sanh, was posted online in the hopes that others could provide information about the Marine, identified only as Martinson, L.P., serial number 1984025, religion Lutheran. Diligent sleuthing by an active-duty Marine named Joshua Laudermilk and others led to the discovery that the tag’s original owner, former Platoon Sgt. Lanny Paul Martinson, is alive and well in Sugar Land, Texas, and thrilled at the prospect of recovering his lost tag. The full story has yet to be told. Definition: When found on the headstone of an individual, the abbreviation U.S.A.F. usually stands for United States Air Force. It has long been common practice for veterans and their descendants to inscribe their gravestone with the branch of military in which they served. This can provide a clue for genealogists searching for military records. My preliminary internet search for the surname Drake and initails F.E led me to a copyright entry on p.348 in the Library of Congress catalog of copyrights with the full name Francis Edward Drake Jr, Minealpolis on Dec 14, 1936. The copyright entry has the following brief: Horse (A) on you; a satire in 1 act, by F.E Drake Jr, c 1c, Dec. 14, 1936. Could he be the same person on the Dog Tag? I would like to hear from anyone who might know the person or his relatives? You were pretty close in area wise. there is a great photo of him in his service uniform at this link. DRAKE, Francis E., Jr., Pfc., USMC. Father, Mr. Francis E. Drake, Sr., 255 Mill St., Springfield. Found a dog tag. The name is Troy, J., 241773,Type-B-, T.9/41 USMC. Hi Joe, I have a friend who has all the records on Marine Raiders. I’ll ask him to check this name and serial number against his Marine records. I will also go to ancestry.com and look for J. Troy in the Muster Rolls there. Sometimes the service numbers are in the records, allowing us to confirm first name and units he was in. Without this resource, you’d have little chance of tracking down this Marine. I do not charge a fee for helping others’ return dog tags and I will only do the research if they are willing to return them, free of charge, to the veteran/family. It sounds to me as if this is what you would like to do, so I commend you for that. It really brings joy to families and veterans to have these tags returned. Please email me at dogtag73@gmail.com and I can email you the info I find on him. When/if you email me, can you please tell me the circumstances of how and where you found this tag? That can be very helpful in finding either the veteran or his family. If I find his family, I’d rather not post their contact info on a public forum, so email is best. Thank you to the creators of this page for providing a way for people to receive help in their research! . I’m looking for any info on Edward J. Kautz (Culbertson NE) who served in the 31st Tank Bn in Africa, Rhineland, Central Europe. Born Oct 27 1905. I unable to find any burial records. He died 02/28/1968 in Sacramento CA. i am looking for a veteran cpl Jack Green who was in the 551 saw bal south PAC. I would like to hear from anyone who served with my uncle in WW11. He served proudly in the 3rd U.S. Army under Gen. George Patton, attached to the 4th Armored Division, 177th Field Artillery, Battery C. He was in the Battle of the Bulge, among other engagements. My uncle was Erwin Wright Stewart, from Four Oaks, North Carolina. Thank you, in advance, E. Wayne Stewart, Four Oaks, North Carolina. Looking for a Bud Norman. Had a wife or girlfriend named Carol. I have an I.D. bracelet my Grandpa found says Bud Norman on front and Hands off he’s mine Carol on the back. Would like to return it to his family. I’m looking for all information about Lt Denny James G. serial number ASNO- 722546. Probably a men who served in the US AIR FORCE. Looking for information on my grandfather. All I have at this time is his name and branch he served. William Fredrick Dial USN, born in Blount County, Alabama, resided in Gadsden, Alabama. Thanks for any info anyone may have. I’m not sure if this may be the relative but the dad was William H Dial………and the wife name changed on the census…. I’ll go check out ancestry.com and see what else I can dig up for you. Please email me so I can send you further info. It’s great that you want to send this tag home to Mr. Mandish or his family. I am looking for any and all information about my dad’s army service during WWII. Vernon O. TeWinkel, born 1922 in Baldwin, WI. He would have enlisted or been drafted from Wisconsin. Cheryl, yThanks to Chuck, you now have your father’s service record, which contains valuable information in your search. He was in the National Guard. I looked up Wisconsin National Guard and found out that he would most likely have been in the 32nd Infantry Division. Hopefully you will be able to find out his exact unit by going here: http://www.archives.gov/veterans/military-service-records/evetrecs-help.html You have to use Internet Explorer for the system to work. You can fill out the form to the best of your ability and then print it out, SIGN it (or they won’t send you anything) and then fax or mail it in. You should have a reply in about 6 weeks. There was a very large fire in 1973 that destroyed most of the Army records, so they may not be able to send you very much. However, you never know. They sent me my uncle’s DSC Citation. Also, try calling up his local VFW and seeing if he was a member. They usually have a file on him that might be helpful in your research. The other thing you might try is to call up the VA and ask them if they can tell you his unit. He is deceased now, so they might be able to give you more information. So, Don served in the South Pacific and was training in New Caledonia with his unit, most likely. Many Army units trained in New Caledonia before the second invasion of the Philippines in 1945, including my uncle’s. Chances are that Don TeWinkle participated in the Philippine invasion if he was in New Caledonia. So, if you can confirm for me that your father either served in England or that the Vernon Tewinkle I found in the River Falls, Wisconsin year book listing is him, then we can begin researching units from WI that fought in England during the war. That will help narrow your research down greatly, as would any clues you can provide from what he may have told you over the years. If you have his uniforms, check his patches. You might be able to identify his unit based on the patches or maybe even from pictures of him in uniform. Ok, that’s it for now. I don’t charge a fee for doing this research, so if you want to email me privately at dogtags73@gmail.com, I hope I can help you further. I cannot thank you enough for your response. Yes, Don is my father’s brother, & is still living (the last of the men of the family), in Sheboygan, WI. So now I know more about my dad’s service, & something about my uncle’s which I didn’t know at all. They came from a family of 9, 6 of them boys. I can’t swear that they all served, but all who did survived. One uncle (Floyd) was at Pearl Harbor. This is silly, but what got me more interested in knowing more about this is I have been watching “Band of Brothers” an HBO series about the Army’s Easy Company, 101st Airborne. A lot of the places they went reminded me of my dad. He didn’t talk much about it, but I knew he was in England and Holland for sure. It made me want to know more. It made the war more real to me. I’m sorry if that sounds blissfully ignorant, but I was born in 1947, so yeh, ignorant. I am eager to explore the link you sent. The way my week is going it may be Friday before I get to it, but I’ve flagged your e-mail. You may hear from me again, if you’re sure that’s ok.
Cheryl, sorry, it was late and I messed up the email address, adding an s. The correct email is dogtag73@gmail.com. Sorry about that. Are you in touch with your Uncle Don? He might be willing to speak to you about his own service and be able to tell you where the rest of his brothers served and maybe even the units. I’ll look forward to getting an email from you. P.S. I have a couple photos of him in uniform, but don’t know how to show you since your e-mail doesn’t work. Hi, I found a WW2 canteen in an antique store and on the bottom of the canteen it said the name of the person named Terry Riley. This was very intriguing, so I’d like to discover more information about this “Terry Riley” and where he served and possibly how he died, IF he died in the war. Please leave a reply. Does the canteen have a serial number or any other identifying info on it? Can you find out from the antique store where they got it from? I can tell you that with just the name Terry Riley to go on, it will be difficult. Is it an Army canteen? Where was the antique store located? That might be helpful in finding the correct Terry Riley, but a serial number would be much more helpful. I am looking for information on my great uncle, my grandfather, my other grandfather and my great grand uncle. My great grand uncle is Robert Martin Cuervo and he was in the US Navy and served around the time of the Korean War as did both of my grandfathers John Rogers Cuervo and Donald Lee Skiles. Finally, any information on my great grand uncle Samuel Clinton Burns POW during WWII would also be most helpful. I am much obliged. Jul 10, 2013 – This WW2 POW or prisoner of war record for Samuel C Burns is just one of over 143,000 found in our historical archive for U.S. servicemen and civilians who were held captive by Germany or Japan during World War II. Our archived military lists include officers as well as enlisted men and women, reservists, etc. Sources of our data are government and public collections and files. We typically work with military records that are difficult and even impossible to locate without extensive knowledge of how or where to begin searching. Can this guy be still living? If so here is how to contact him maybe he can answer some of your questions. This is a guy over 65 living in Georagetown Ill maybe he can help. I’m looking for more info on my great grandpa (Henry Smit) and his brother (Andrew G. Smit), both from Michigan. Andrew died in WWII when his ship was torpedoed on his way home on leave. Henry survived WWII, and died a few years ago. He was a mechanic. I can’t find any info about him on the Internet. I don’t know any more than that. Anything you can find would be wonderful!!!!! Oh, Andrew did not die on the way back from the war. All we know about his death is that he was buried in Honolulu and died on November 30, 1945. Note: Entered the service from Michigan. Help! New post. I am seeking information on Lt. (JG) Irving Emerson Silverstein. US Naval Reserve. I believe he’s buried in the Long Island National Cemetery. Believe DOB to be 3/12/20 DOD 7/8/43. I have a letter written by the father of Irving Silverstein. The father, H. J. Silverstein addressed the letter from an address on Ocean Pkwy. Brooklyn, N.Y. Unfortunately an ink blot has hidden the first few numbers of the address. I believe Irving was married. I am trying to locate any I formation about him and his family. I’m hoping there are surviving children or grandchildren I can make contact with. There is no family connection on my part. This is just a story of a young man that died near my families home in North Florida and a connection that was made as he passed away. Thank you for any help with this. I’m not a genealogist so finding information hasn’t come easy. Blessings! There is a copy of his headstone at this link. Looking for more information on first cousin, Anthony S. Greco, MC, USA. KIA 22 June 1944 Montepescali, Italy. Appears as if friendly fire incident. Attched to 701st Tank Destroyer BN. Unit after action report of poor quality. Any ideas for other places to look/information would be appreciated. Thanks! I found a framed Japanese flag with several signatures (no ranks) as well as “LUZON POW CAMP #1” and a black and white photo attached to the frame. The photo has two soldiers standing beside a sign that also indicates Luzon POW Camp #1. I was able to purchase the flag with the help of a friend and we are gifting it to the National Infantry Museum, Ft Benning, GA next week. I have tried to find any of the men whose names are inscribed on the flag by googling their names. I’ve been able to connect a few to WWII and the Phillippines. Not sure how to attach a photo here? The name in the center of the flag is “Harold Herd” “The Great” and the date written is October 4, 1945. We know the camp was liberated 30 Jan 45 so the date discrepancy is curious. We do not doubt the authenticity of the artifact. I simply wish I could trace it to someone. I’m sure the NIM will work diligently to do so. Found a Basic Field Manual for First Aid for Soldiers, April 7, 1943. Has a name printed on it…Pvt. Quention Z Johnson………….Would like to find him or relatives .